Did you know that Marlin from “Finding Nemo” was written as a protective parent because Andrew Stanton, the film’s director, was a protective parent? Stanton tells the story about how he was walking with his son to the park one day and was worried that his little guy would get hurt. In that moment, Stanton wanted so badly to be a good father but he also realized that by being overprotective, he was missing out on being present with his son. It was an ironic - and totally relatable! - parenting dilemma that provided the glue to the story of “Finding Nemo”! Speaking of Stanton, two other super fun facts: Darla, the annoying red-headed girl with braces who endlessly taps the fish tank, was named after Darla Anderson, the producer of “Monsters, Inc”. Anderson has been the perpetrator of a lot of practical jokes on Andrew Stanton over the year, and she believes that naming the most annoying character in the movie after her was his way of getting back at her (yeesh…wonder how she’ll get back at him?!). AND, one of the boats docked in the Sydney Harbo - the Aeolus III - is also named after Andrew Stanton’s dad’s boat. The boat actually had another name at one point, but when Stanton realized he had forgotten to put his dad’s boat in the movie, he scrambled to add it in! Which all begs the question: Is there anything about “Finding Nemo" that wasn’t about (lovable, funny, totally talented) director Andrew Stanton?! 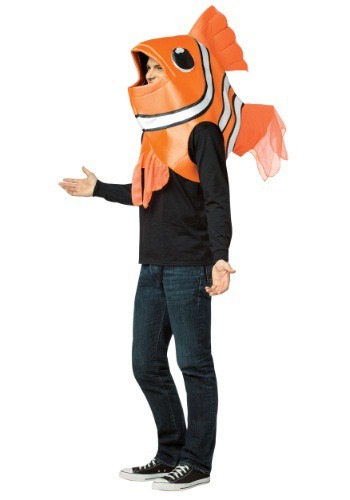 So do your part to bring the focus back on the fish with this Adult Clown Fish Costume! Made of 100% polyester, this pullover costume has face and arm slots for a comfortable fit, and sports mesh tail and front fins for a fishy look! Transform yourself into everyone’s favorite fin-flipping dad this Halloween - in this cartoon-themed get-up, it’s sure to be a swimmingly good time!